– Dating. UGH. Spring is here and I thought, it would be nice to have a boyfriend, but that means dating and looking for one! Ugh to the infinity power. – The next chapter of my book, which is going to feature a composer named Morten Lauridsen, and other living composers, but a piece of his is going to be the focal point of the chapter. I have to actually try contacting the guy. 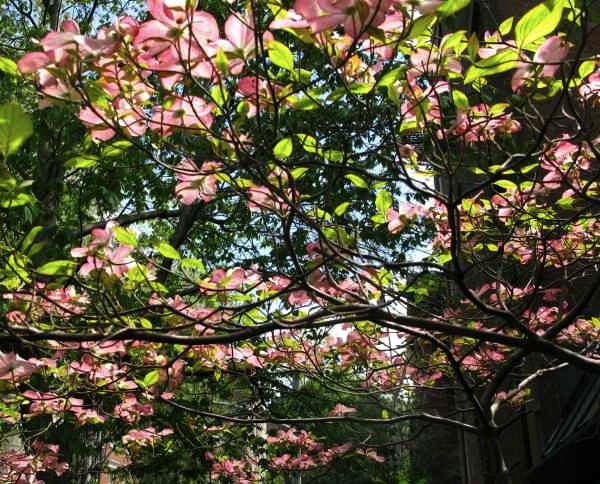 A pink dogwood tree, my favorite! This is in Manhattan. There’s a number of them. Dating? You are a braver person than I. I’d rather flagellate myself with barbed wire than get back in the dating pool. Hahahaha. ME TOO. Notice it’s on my list of things I mean to do but haven’t actually done yet.